Criterion Collection is releasing The Complete Monterey Pop Festival offering music lovers young and old alike a chance to experience this classic free concert from the hippie era. The set features all three of filmmaker’s D.A. Pennebaker’s films from the event, Monterey Pop, Jimi Plays Monterey, and Shake! Otis at Monterey plus a disc of outtake performances that didn’t make it into the original film and never had a release. Over the years, The Monterey Pop Festival has become a sort of lesser known sibling to the legendary Woodstock festival, but this is the festival that kicked off the so-called summer of love in 1967. It virtual introduced Jimi Hendrix to America with his dazzling set ending flaming guitar sacrifice, featured an energetic Janis Joplin fronting Big Brother and the Holding Company laying down their patented brand of white soul, and included a set from he searing Otis Redding. Other artists on the docket included The Who (Pete Townshend and Jimi Hendrix famously feuded backstage over who should go on first because Townshend didn’t want to follow Hendrix), The Byrds, The Grateful Dead, and Simon and Garfunkel, among others. The majority of these people didn’t make it into Pannebaker’s edited down film, Monterey Pop, which landed in theaters a full year later. If you’re going to break out full sets to release as a films in their own, then Jimi Hendrix and Otis Redding are darn good choices. The Hendrix set is magical. He must have seemed like an alien descending on the crowd – some sort of spaceman speaking in the language of loud distorted squeals and feedback. Playing the guitar behind his back, between his legs, cajoling the sounds like a symphony. Take a look at the stunned faces of the women in the crowd after he finishes “Wild Thing” to get an idea for the impact Hendrix had. Remember, this is long before Eddie Van Halen, Randy Rhoades and Steve Vai. Otis Redding was one of the great soul front men – his gravelly voice perfect for the upbeat numbers, but also smooth enough for ballads like “These Arms of Mine”. Monterey Pop put him in front of a mostly white hippie crowd that probably never experienced his sort of soul before, especially not live, and he electrified the crowd with a set that included soulful, R&B versions of The Stones’ “Satisfaction” and his original, hard-hitting “Respect,” that takes on a whole new meaning when sung from a male perspective. The outtakes disc is a goldmine of classic performances not seen in their entirety in years or ever, from the likes of The Association and Country Joe and the Fish. Watching through these performances is both heartening knowing how many have died (Hendrix, Mama Cass, Otis Redding, Keith Moon) tragic deaths and invigorating in its originality and inventiveness. These songs and performances have stood the test of time and continue to inspire artists, young and old, today. Monterey Pop, Jimi Plays Monterey, Shake! Otis at Monterey, and the outtakes are all presented in their original aspect ratio of 1.33:1. 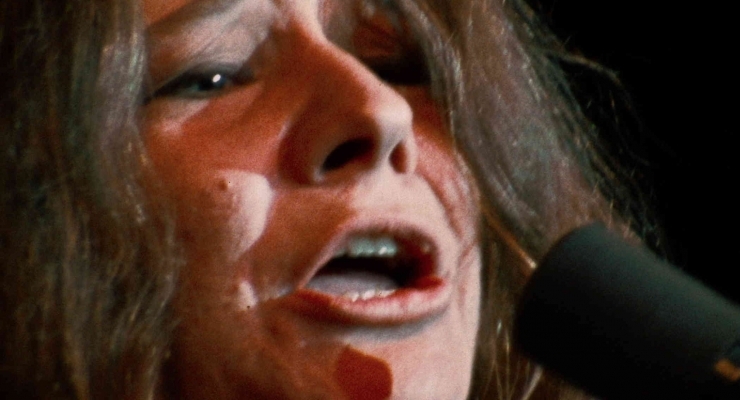 The new digital transfer of Monterey Pop was created in 16-bit 4K resolution on a Lasergraphics Director film scanner from he 16mm original A/B camera reversal at Metropolis Post in New York. The 4K digital restoration was done in L’Immagine Ritrovata in Bologna, Italy and additional restoration work was undertaken at Criterion Post in New York. High-Definition digital transfers of Jimi Plays Monterey and Shake! Otis at Monterey were done on a Spirit DataCine from the 35mm duplicate negatives. Digital transfers of the outtake performances were created from 16mm reversal prints. Dirt, warps, scratches, debris, splices and other anomalies were manually removed using MTI Film’s DRS and Digital Vision’s Phoenix was utilized for jitter, flicker, small dirt, grain, and noise management. On Blu-ray, the films and outtakes are all presented in AVC 1080p encodements that look organic and filmic with good grain structure. These are grainy films and even though they have been cleaned up nicely, the grain is still present, but it looks surprisingly crispy. Colors look vibrant given the decades that have past. Monterey Pop does stand out as the better looking of the bunch given the 16-bit 4K restoration, but it is only marginally better than Jimi Plays Monterey and Shake!. The outtakes offer the lowest quality, but are still satisfying to watch given what they are. For audio, we get three options on The Complete Monterey Pop Festival from Criterion Collection. The original stereo mix was remastered from the 35mm magnetic track. The new stereo and 5.1 remixes for Monterey Pop and Shake! Otis at Monterey were created by Eddie Kramer from the original 8-track analog tapes made at the concerts by Wally Heider. The audio for the outtakes was mixed by Howard Frank and Dennis Dragon from the original concert recordings. Pro Tools HD was used to removes extraneous noises like clicks, thumps, hum, and hiss. The sound is superb for these performances given the source and vintage. Live recordings weren’t exactly cutting edge in the United States in 1967 and these films were also limited to 8-tracks, which was pretty advanced technology at the time (Sgt. Pepper was recorded on a 4-track). The new 5.1 mix is good, but do realize it is using modern sound effects to add ambience into the surround channels. Even with that, it sounds rather authentic. The new stereo mix is really well done, with good, modern aesthetics, dynamics, and punch. Audiophiles should appreciate it. Criterion really comes through with a packed collection. The interviews and commentaries are absorbing, but the short film Chiefs, which ran with Monterey Pop in 1968 as a companion film is a strange choice still. The book filled with essays is a good read from cover to cover. Chiefs (1.33:1; 1080p/24; 00:19:52) – Short film directed by Richard Leacock that accompanied Monterey Pop in theaters in 1968. The film, shot shortly after the Monterey International Pop Festival, filmed in Waikiki, Hawaii during a convention of American police chiefs. Leacock, D.A. Pennebaker’s partner in Leacock-Pennebaker Productions, encounters the officers discussing the Black Panther Party, the Democratic National Convention in Chicago, and the latest weaponry. Interview with Pete Townshend (1.33:1; 1080i/60; 00:04:35) – Conducted in London in 1987 and produced for VH1 by Tom Kaniewski. Commentary – Music critic and historian Charles Shaar Murray, recorded in London in the spring of 2002. Additional excerpts provide further details on the music career of Jimi Hendrix. Commentaries: – These two commentaries feature music historian Peter Guralnick and were recorded in Boston in the winter of 2002. The first is a song-by-song reading of the film. The second is a look at Otis’ career, pre- and post-Monterey. Interview (1.33:1; 1080i/60; 00:18:45) – Interview with Phil Walden, Otis Redding’s manager from 1959 until Otis’ death in 1967. This interview was recorded in Atlanta in the spring of 2002. The Hunt Club (1.33:1; 1080p/24) – Using only the illumination of a cigarette lighter, D.A. Penebaker captured Tiny Tim performing a number of traditional folk songs at Monterey’s Hunt Club, the official greenroom for the festival. 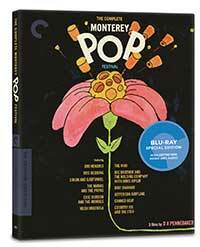 Criterion Collection’ The Complete Monterey Pop Festival is a beautiful set of this 50-year-old music festival. This one is must-own for the music fan just discovering this era or for anyone who lived through it. The Complete Monterey Pop Festival is out on Blu-ray and DVD from the Criterion Collection December 12, 2017. The documentary film of the classic rock music festival that kicked off the Summer of Love, Monterey Pop gets a beautiful restoration on Blu-ray from Criterion Collection along with two companion films from the same festival, the 1980s film Jimi Plays Monterey and Shake! Otis at Monterey along with a heavy dose of wonderful outtake performances.